A photographic exhibition by Marion Macalpine of Hackney Keep Our NHS Public that highlights the corporate take-over of the NHS, and is available to borrow. 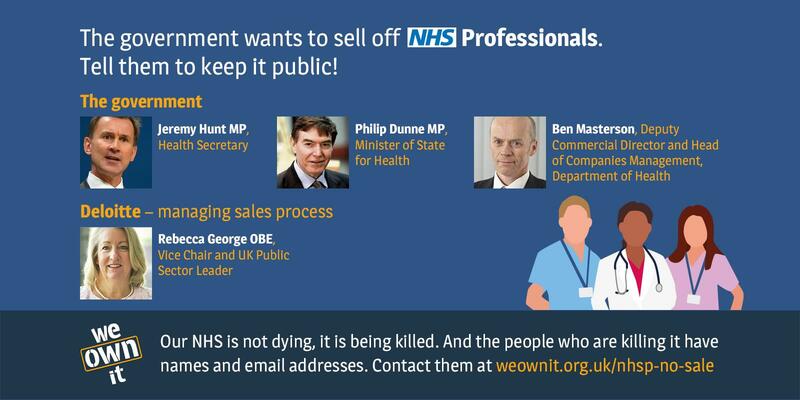 Could you use it to start or build a local campaign to Keep Our NHS Public? Please contact Marion on marion.macalpine@gmail.com to discuss how you could use it. 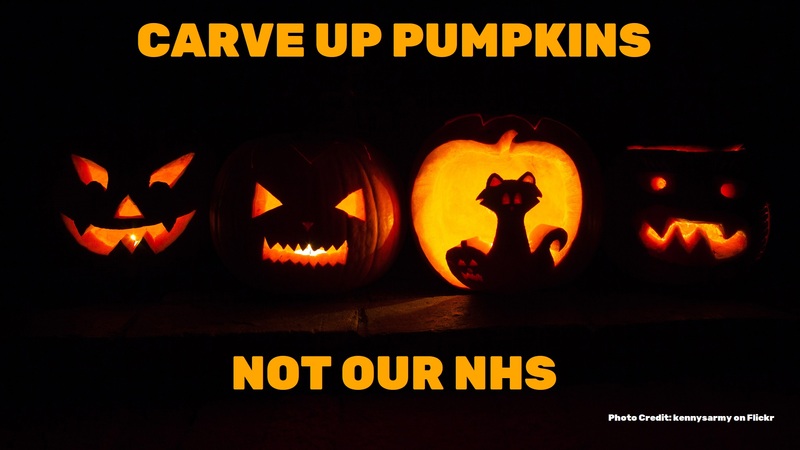 It includes twenty-four photographic panels and brief information highlighting some of the major corporations involved in privatisation of the NHS, and it is available free to borrow, to display in your area and act as a focus for a meeting/leafleting/getting a group together. The exhibition explores the diverse forms that privatisation takes, including PFI contracts; private health companies masquerading as NHS including many GP clinics and diagnostic centres; private hospitals which cherry-pick ‘low risk’ patients; lucrative contracts for highly specialist treatment; healthcare corporations with a history of fraud or tax avoidance; scandalously poor care practice that is no barrier to winning new contracts; private corporations driving government policy on dangerous so-called ‘free trade deals that will open up the UK even further to US corporations. The exhibition highlights critical links between politicians at all levels and private healthcare corporations. It has been updated to include panels on so-called Integrated Care Systems and Integrated Care Organisations. The exhibition has previously been displayed in Ascot, Birkenhead Art Gallery, Brighton (3 times), Cambridge, Chichester, Cheltenham, Deal, Hackney (twice), Hammersmith, Haringey, Lambeth, Liverpool Central Library and the Unite building, the Wirral, Norwich, Sheffield, Southampton, Stroud, Tower Hamlets, Waltham Forest, Whitstable and at the conferences of both Keep Our NHS Public and Health Campaigns Together. "The information was overwhelming and shocking. It should be in the news every day but I can imagine why it is not. I am glad I came to the exhibition." "This is a brilliant exhibition , terrifying and incredible because it is so direct, easy to take in and understand the huge implications for all of us." "Superb work - informative, important and a bit of hope for the future"
"This has made me so angry! How come we didn’t know indeed!" "Thank you for this exhibition - it’s a revelation!" "A real eye opener about a topic which I knew little about. Keep fighting the good fight." "Frightening . Real. Believe it." "Brilliantly revealing information and absolutely shocking. Needs to be widely shown and publicised. Thank you." This is a prime example of the devious under handed dealings of Corporates and Private Enterprises. To make matters worse, our Government are helping, by placing people in positions to assist. I had a new hip in 2005, then had 4 back operations on my back 2 within 3 weeks of each other, after the 4th operation I went to see my surgeon to see the result of that operation with my wife at that consultation which was also attended by 3 medical students my surgeon said to me I will now QUOTE, Peter I am afraid that need to operate on your back again for the 5th time, then said but I will have to apply to those '' JOKER'' in No 10 for the money and I do not expect them to give it to me . He then turned to his students and said Quote This is what is coming to you 3 very soon that was in 2013 Soon after this consultation he left the N H S hospital after very many years service. I am still waiting, and I have had copy's of letter (supposedly) that have come from him which I do not believe as his signature was not on any of the letters. Giving different reasons why he did not carried out the 5th operation. One said that he did not think another operation would help me, another said I was to Fat , When I told another surgeon he said that comment was rubbish. On another occasion my Hip surgeon surgeon said to me that this situation had gone on far to long and he wanted to have a meeting with my back surgeon to sort out my problems, I then get a telephone message and was told that under the N H S RULES that the Hip surgeon was not allowed to have a meeting with the back surgeon. When I asked to see those N H S rules in writing I just got pushed from one person to another and never did get an answer to any of my questions. I am now being seen by a different surgeon and when I ask him to contact the my back surgeon to ask him what he saw in my back that he thought he could operate on to help me, he says that he cannot even though that he is now working at another hospital near by. I worked in the NHS for many years when it still really was the NHS. As it has been carved up and sold off, there has been a noticeable decline in the cohesion of the service as a whole, with illogical divisions between parts of the service and no real connection between different staff who are all dealing with the same patient/person. Decision-making gets fragmented (also known as the left hand having no idea what the right hand is doing) and no-one ends up with the whole picture of the patient's/person's needs. There have been many errors arise from this lack of co-ordination which puts patients and staff at risk and errors in care jeopardising outcomes. We need to return to an integrated service for the good of everyone, whatever their role in the service and to keep it in PUBLIC ownership.